Belle Aurora: Dirty OUT TODAY! This a story of betrayal, lust, love and loss. It’s one of those books that you just have to read with minimum pauses, the suspense of not knowing how it ends is just too much to bear. Alejandra’s life has a meaning. Her purpose is to be the bond, token of alliance between two mafia families. She doesn’t want it, but that doesn’t matter. Because everyone has to make sacrifices in the name of the greater good. And so she marries Dino. And that’s the end of her fairytale. The horrors, abuse and pain she goes through are beyond hell. Betrayal is her way out to freedom. Without hesitation she crabs the one chance she gets, knowing there’s no coming back. Julius Carter deals justice in the underworld, he is the judge and executioner. He’s the one, who gives Alejandra her freedom but by doing that, becomes also betrayed by her. Their fates are entwined as Alejandra refuses to go back and Julius tries to find a way to correct the wrong judgement he made. This story has a four POV’s. And out of the four, there was one I didn’t like at all, no matter what, the character couldn’t win me over. I should have felt sympathy, grief and need to avenge for this character, but no, I felt completely indifferent. But the other three, I liked a lot. Belle Aurora has a talent to write wrecked characters. She knows how to portrait them, so that even they do horrid things, you feel their actions are justified. Got to love Ling, right? The best part of the book for me was Twitch. For the final time, he’s settling the score. He wants nothing more than to go home to his son. On the way home his path crosses with Julius’ and Alejandra’s. And he’s the reason, I’m gonna read the next book in RAW-series. Belle Aurora writes well, story flow is good and all the different POV’s intertwine seamlessly. The story is violent, brutal and raw. It is a depiction of scarred souls and bodies and the laws of the underworld. There is code to follow and that code is above the family ties.Alejandra isn’t the only one in the book who learns it the hard way. Dirty is a love story too, but instead of romance and beautiful moments, it’s filled with desperation and fear. It is a raw depiction of what happens to people, when you corner them, strip them of their humanity and leave them with nothing to lose. Next PostIT’S LIVE + HUGE GIVEAWAY!!!!!! 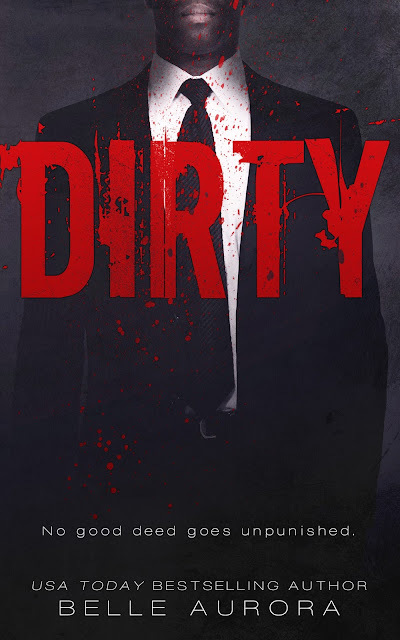 Dirty by Belle Aurora is now available!! !